Then I realized that my couture class with Susan Khalje is just around the corner (from October 8th!) and that students are asked to come with a fitted muslin. And, of course, I was not ready! 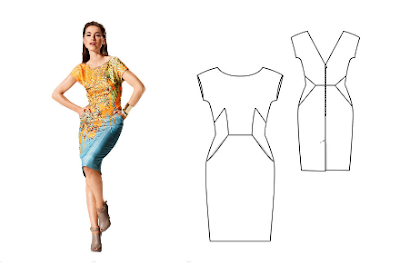 The pattern I'll be working with is from the September Burda edition. The challenge that I've set for myself during the workshop: learn from a professional how to work with silks. So let's see how it goes! It's raining again today.... What are your favorite rainy-day activities? Ooh, there's nothing more relaxing than a rainy day when you don't have to go out! I love to knit, watch movies, read, or just cuddle with the dogs on rainy days. Sometimes I get motivated to do some organizing, but most of the time, I love to just hang out! You are going to have such a great time at the seminar! It was being held at our school last week and I peaked my head in. Looked like so much fun! I love the pattern you are going to be working on! Can't wait to see it unfold. And I agree with Ginger. A rainy day when you don't have to go out is perfect. For me, it's a great time to sneak in some sewing while the boys play inside and I don't feel guilty that I should be doing something else! This may sound bad or pathetic but your Saturday doesn't seem so bad! It sounds like it was the perfect pace that all Saturdays should have - not too busy but not too slow. Menudo vestidazo has elegido! WOW and WOW! En Euskadi en otoño es típico buscar setas en el monte, nuestra familia tiene mucha afición, y la verdad es que me encanta vestirme con ropa de monte y apropiada para la lluvia y pasear por un bosque lleno de robles o hayas para buscar setas bajo la lluvia. El ruido de la lluvia sobre las hojas y el ruido de los pasos sobre las ramas rotas y hojas secas...me encanta! !Como me gusta buscar setas! Quando fue peqena siempre iba con mis padres. Hace tiempo que vivo en metrópoli fuera de bosques ;( Tu descripcion es tan poetica. Me siento mucha nostlálgiaca...Una razón mas para visitar Euskadi! I so cant wait to see and hear how this turns out! I'm in love with that dress pattern and think it would look stunning in silk. Oh, I love that dress! It will look great on you! I love to have an excuse to sit at home...I can sew...actually since I no longer live in a big city I am getting used to not having much going on. So your weekend plan sounds very familiar! Goodness, this is too exciting! A class with Susan, and the Matthew Williamson dress. I have to go and calm myself down! Thank you so much, Melanie! The closer the date the more stressed I become. Maybe some hard liquor can help manage my emotions! I've been living in big cities forever (maybe last 16 years). My secret fantasy would be to relocate to a quieter place: ideally an island!